Estimates are ALWAYS FREE and scheduled in a timely manner. We would love to know more about how we can meet your needs. Welcome to Greg Hart Home, and thank you for stopping by. Interior Painting, Drywall Repair, Molding, Wallpaper Removal, Wood Rot, Roof Repair, Siding Repair, Gutter Cleaning, Deck Repair, and Vinyl Shutters. 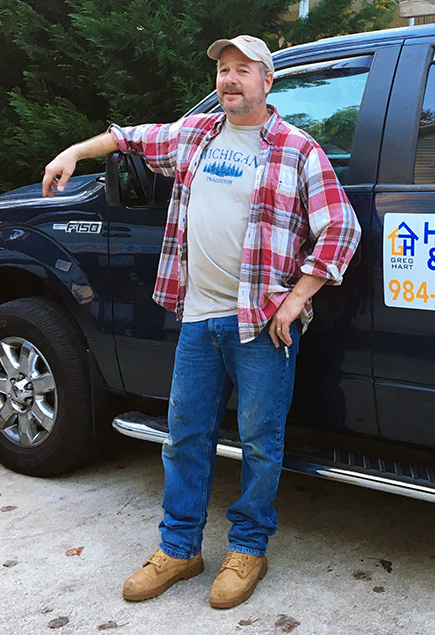 Greg Hart Home Repair and Painting is a company that prides itself on building trustworthy relationships with homeowners. We have over 30 years experience in general home maintenance, repair skills and painting. We manage all tasks in a timely manner to meet all of our clients needs with professionalism, honesty and dedication. We offer the best possible service with the best possible prices. Read some testimonials from my satisfied clients. We have a wood balcony and railings on our house above our front door. It was peeling and falling apart. Greg replaced the rotten wood, scraped and painted it Great job, highly recommend! We hired Greg to paint and caulk our family room ceiling. We had dark stained wood beams on the ceiling. We wanted them white to match the ceiling. Greg did a wonderful job caulking all the cracks, primed and painted them along with the ceiling and made it look beautiful. We are so pleased with the end results. Greg was very professional and reasonably prices. He did a wonderful job. We were having a problem with critters getting under our deck. Greg came out and installed lattice around the bottom of the deck. He did a beautiful job, no more critters. He was great to work with and very reasonably priced. Greg Hart had done many jobs for me around my home. He has painted, repaired drywall, fixed exterior siding and gutter cleaning. He is a pleasure to work with. Highly recommend. Very professional and honest... Fair quote with superb results! Greg Hart is a true craftsman that prides himself in doing it right. Old school guy that still hand nails everything. Greg repaired some leaks on my gutters and cleaned out all of the leaves. Now, no more drips!! He was very reasonably priced, efficient and a great guy! © 2019 Greg Hart Home | All rights reserved.